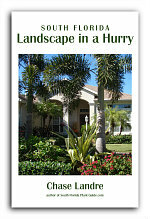 The unusual shape and coloring of the triangle palm makes it a boldly artistic and formal landscape accent. Instead of a typical crownshaft, triangles have overlapping leaf bases that form on three distinct sides. The leaves and stems are a unique powder blue-gray or gray-green. This palm always catches the eye - creating an elegant focal point wherever it's placed in the landscape. This also means it will draw attention away from other landscape elements, so it's best used alone or as pairs rather than in rows or groups. The triangle is a slow to moderate grower to 20 or 25 feet. Very drought-tolerant once established, it does fine in sun to part shade anywhere in Zone 10. 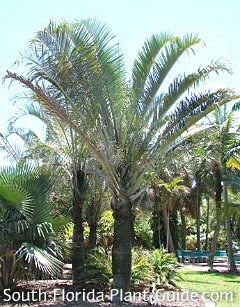 Plant in a well-drained area adding top soil or organic peat to the hole before placing the palm. 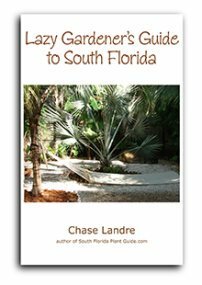 Fertilize 3 times a year (spring, summer, fall) with a good-quality palm fertilizer containing micronutrients. Trim old fronds as needed - not often necessary, since this palm grows at a slow to moderate pace. 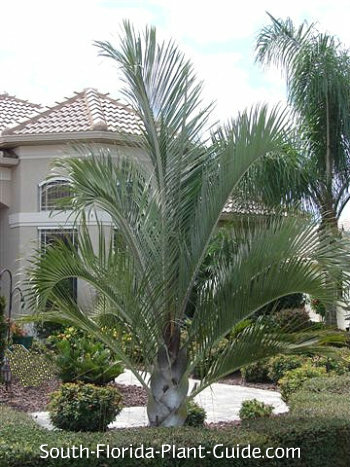 Though this palm puts up with dry conditions, give it water to get it established and during long, dry spells. Plant 5 feet or more from the house. Because the fronds arch upward from the trunk, a triangle can be used in tighter spaces and nearer walls and walks than many other ornamental palms. These palms work fine while young as container plants. 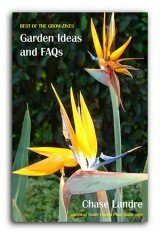 COMPANION PLANT SUGGESTIONS: When planting around the base of a triangle, use plants that can take drier conditions, such as coontie, crown of thorns, green island ficus, dwarf bougainvillea, and ice plant.